Ok, guys. Brace yourselves. I am so beyond super excited to be bringing this post to you. 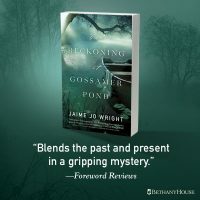 Author Jaime Jo Wright has done it again with her second novel, and I just couldn’t help but share it with you. If you follow me on Facebook, you’ve seen me post about this book and pre-ordering it. But today, y’all are in for a real treat. I have an actual excerpt from the book for you! If this sneak peak doesn’t whet your appetite and make you run right over and order it, we need to check your pulse. I have had the pleasure of meeting Jaime in person, and she is kind, compassionate, hilarious, and a coffee lover—which y’all know I’m all about! Not only is she one of the kindest, most genuine people you could ever hope to meet, she’s a kick-booty writer. I could NOT put her first book down, and her latest—which releases July 3—isn’t any different. 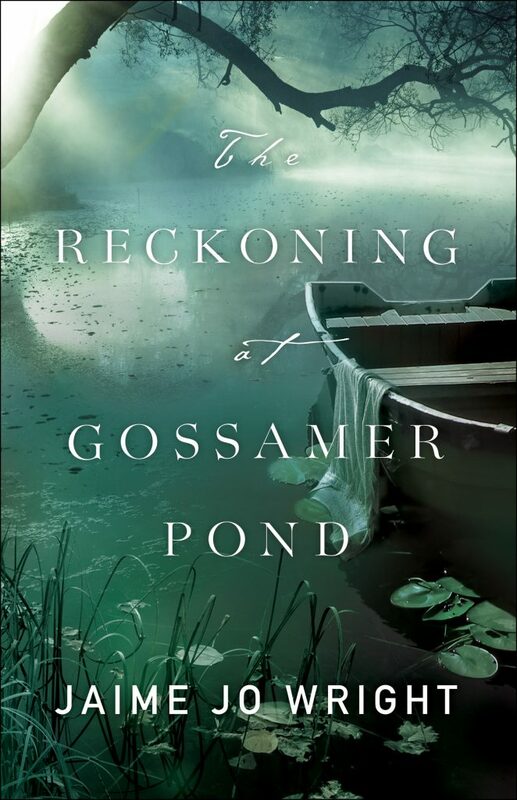 So, ladies and gents, enjoy your sneak peak at The Reckoning at Gossamer Pond. Keep reading and you can enter to win your very own copy!! A low fog settled over the grassy lawn by Gossamer Pond, with the moon a half slit in the sky. Within a few days it would be a moonless sky, like the pall the funeral earlier that day had left over the town. The evening breeze sent a chill through Libby as she paused. The outline of a large tented structure rose alongside the pond, its frame imposing and new. Dusk outlined the rectangular tent, its canvas a dark gray with the front doors pulled wide and fastened back to invite souls inside. Ropes stretched from the corners and midpoints of the structure to wrap around metal posts hammered into the ground. It was almost like a circus tent, only this wasn’t the Big Top, and the entertainment was a different kind of show. It was spiritual. Residents of Gossamer Grove lined up their various forms of transportation in the field just west of the tent. Motorcars, wagons, carriages, and some lone horses. Men, women, and children alike all gravitated toward the tent’s entrance. Libby knew they were a mixture of curiosity, faith, and trepidation. Tent revivals had been sweeping the nation the last few years and had finally made their way to Gossamer Grove in the form of Jedidiah and Jacobus Corbin. Since the mid-nineteenth century, people such as D. L. Moody and Billy Sunday had been shaking up people’s eternal security. Some, like Moody, seemed well received, with church revival spreading rampantly. Others, like Sunday, were stirring controversy with unscripted tirades from a mouth straight from the baseball field instead of the seminary. Mitch had told her one paper he’d read said Sunday was so “raw” that they refused to print his words. He used language unfit for feminine dispositions, and even some men were so stricken by his preaching, they were taken from the tent on stretchers, having swooned like a female whose corset was tied too tight. Libby narrowed her eyes, attempting to catch a glimpse of the Reverends Corbin through the bright lantern-lit inside of the meeting place. Supposedly, the twin brothers had traveled with Sunday for a while and now had struck out to evangelize on their own. Hopefully, tonight’s female attendees had loosened their corsets—assuming the Corbin brothers had picked up on Sunday’s bad habits. The smell of kerosene from the lamps was pungent as she neared the meeting place. Libby searched for Mitch, but there were so many in attendance, she couldn’t find him. The message he’d left with Paul to have her join him at the tent revival meeting left her scrambling to help finish proofs on the articles going to press that night. She gave Paul a timid reminder to be prepared for Mitch to come busting through the doors at midnight with a special report on the revival. Paul’s sneer told Libby all she needed to know about how he felt about that. Libby caught a glimpse of Old Man Whistler, the town drunk. She was taken aback that he would even be here, and yet it stood to reason, she supposed. The Corbin brothers were a curiosity. Whistler brushed alongside her, his shaking elbow knocking into her arm as his knuckles gripped the bulbous end of his cane. “Come to get yerself saved?” he cackled, and Libby tried to hide her repulsion toward the old man and his musty breath. “I already am, thank you.” She moved a step away. The elderly man gave her a sideways glance before leaving her side. Libby swallowed hard. Hide their sin? She watched him wobble toward the tent’s doorway. Old Man Whistler probably should not be underestimated. He was a wanderer, and wanderers saw things—knew things. His remark struck close to the obituary’s heart. The insinuation of hidden sins. But, Deacon Greenwood’s slate was so clean, even Mitch had never been able to find a speck of dust on it. Libby startled as a grating shriek erupted from inside the tent. Gracious, there was an organ! The music began to play, and the shivering tones and airy puffs from the pump organ blasted from the door. Row upon row of attendees lined two sides of the tent with an aisle down the middle covered in sawdust. Libby should have come earlier to find Mitch. There was no way she would now. She stretched up on her tiptoes, but the sea of bowler hats, feathers, bonnets, and bare heads made identifying anyone nearly impossible. The sun had almost completely gone down, and even now, little children were being shushed as ushers made their way up the aisle indicating they were not to disturb with whining and crying. Libby moved to the other side of the tent, hoping she could edge her way inside and find an unobtrusive spot to stand along the canvas wall. It was hot inside the tent, stuffy with the smells of perfume, sweat, and fresh sawdust. She fumbled with the neckline of her blouse, tempted to remove the cameo brooch and unbutton the lace at her throat. The organ music whined to a halt. Someone coughed. A child whimpered and was quickly shushed. Libby strained to see the front. A modest stage, a pulpit, and . . .
Libby froze. The vivid picture the Corbin brother drew had the entire meeting place holding their collective breath. Trepidation spread uninvited through the shelter. Jedidiah Corbin was a man of medium height, with lamb-chop whiskers along his cheeks and wavy brown hair parted down the middle. He couldn’t be much older the Libby. His early thirties perhaps. The flyer advertising tonight’s event identified this twin as the eldest. His brother, Jacobus, was very obviously missing from attendance. Libby scanned the crowd around her, twisting the material of her dress in her hands. Running was implausible, but preferable to being here. There was no comfort—no conviction—in the words. Merely impending doom and destruction. Jedidiah Corbin might as well have combined his message with Edgar Allan Poe’s poetry, and the congregation would have barely been able to tell the difference. She jumped as Corbin’s foot stomped on the platform. An audible gasp arose from the crowd. Whether from the language of curses and vulgar frankness mixed with grace or the reference to hanging, Libby wasn’t sure. Murmurs and heads turned toward each other. Libby’s throat closed with the claustrophobic reality that Reverend Jedidiah Corbin danced on the circumstances of Deacon Greenwood’s death. Libby shoved through the people toward the tent opening. Her breaths came in short, suffocating gasps. The black sky outside, with only the tiny shaft of moon to light the banks of the pond, held little escape from this sense of being squeezed. She hurried to the pond’s bank, staring into glowing waters. She shrieked. Spinning around, her arms wrapped across her chest, she squinted in the darkness at the form that had come up behind her. She glanced toward the pond, a deep gray reflection rippling in the water. Being trapped between the water and the shadowy form was intimidating. The man tipped his head, and as he did, his face turned into the shaft of moonlight. “It’s you.” Libby’s breath released in a whoosh. She stepped toward him, away from the bank. “The thought did cross my mind, but of course that would be nonsensical, and it wouldn’t help a soul.” Libby abruptly ended her nervous chatter. Her skin had broken out into little bumps. Libby nodded. “It was quite . . . well, I wasn’t finding myself drawn to salvation. Maybe if I’d stayed I would have. I mean, it’s not that I’m not saved as it is, but if I weren’t—if I didn’t believe in God—I mean, the crucifixion and resurrection of Christ—then I would be going to hell, I suppose.” She stumbled to a halt. Elijah was not standing before her to inquire about the state of her eternal soul. “Why are you here?” She sought for an avenue of escape from her scattered thoughts. Elijah took a step closer to the pond, and he watched its dark outline for a moment. “My father was to give the closing prayer.” His quiet voice, so matter-of-fact, explained why a grieving son would attend a revival meeting on the day of his father’s funeral. Not that it would have been enough of a reason to give Libby the compulsion to attend, but Elijah was, after all, a Greenwood. They stood on principle, not feelings. She floundered. But it hadn’t been suicide, had it? She knew it. So, if he were honest with himself, did Elijah. Elijah’s jaw worked back and forth in the darkness. She could see the sharp outline of his chin, the cleft there, and the sad lack of joy at the corners of his eyes. Libby tried again, mustering the courage to confront the man she far preferred to stay in the shadow of. “No.” Elijah held up his hand. She wished Elijah would say something—anything. But he pushed his hands in his trouser pockets instead. Libby couldn’t read his face in the darkness of the night. His shoulders were tense, but finally he drew a deep breath in through his nose and let it out through his mouth. His words were grave, his tone deep, telling, and all too knowing. It was an unfair question. Hurtful. But burdened with truth all at the same time. Elijah leaned forward, his breath against her face, and his mouth inches from her nose. “This is . . . is, well, it’s murder. That’s what it is! To pretend it’s nothing is cowardice!” Libby knew she should not have said the words the moment they filtered from her lips. His whispered words hung between them, bringing the horrid truth into the moment and damning their souls in the echoes of the tent revival. And if you just can’t wait, click here to order The Reckoning at Gossamer Pond from your favorite retailer. Thank you for the excerpt and the chance to win!